"Ever since I was a child I have had this instinctive urge for expansion and growth. To me, the function and duty of a quality human being is the sincere and honest development of one's potential." Rizin FF News: Miyuu Yamamoto set to make her MMA debut in the September 25th RIZIN event!! Miyuu Yamamoto set to make her MMA debut in the September 25th RIZIN event!! Please find below the Interview with Miyuu Yamamoto. Q: You mentioned in the press conference that your father Ikuei wants you to always be fighting? Miyuu: Yes, that’s right (laughs). When I was younger, I always thought wrestling was something you would do until about 30. But here I am at this age, still going. The younger kids in Canada keep pulling me along. There is a saying in English that age is just a number. Doing something depends on how much you want to do it. Q: Have you always watched MMA? Miyuu: I watched it a lot, yes. Even if I didn’t necessarily like it at times, I had to watch it (laughs). My brother, and now my son, are doing it. Q: And now you are (laughs). Miyuu: I really didn’t imagine myself being in this position. I was just focused on being part of the Rio Olympics, I really believed I would be there now. When that fell through, I got the offer from RIZIN which was just the right time in my life to try. I am the kind of person who never backs down from a challenge. I never want to think “what if?” so that’s why I decided to give this a shot. Q: Is that because your father raised you to be someone who will try anything? Miyuu: Yes I think that plays a big role in it. He was always there supporting me in everything I did. Whenever I was contemplating doing something, I was able to move swiftly and decide to start doing it knowing that I had his 100% support. This was also the case when I first stopped wrestling. This is the way I live. Q: I think this new challenge you are about to face will make you an inspiration for all single mothers up and down the country. Miyuu: Really? I am very glad to hear that, thank you. However, I think single mothers all around the world are already very strong women. They have to play both parent roles. It’s more of a case of us all doing our very best together. Q: You’ve been wrestling your entire life. I don’t think your kids will see your current everyday routine as anything different to what they are used to. Miyuu: Yes (laughs). The way I train won’t be any different, and they know this is their mother’s lifestyle. Q: So there aren’t any big differences? Miyuu: No, not at all. When my daughter first found out that there were punches and kicks involved, she was a little upset but she comes to training with me everyday and watches me so she knows what I am doing now. Of course I am still just a beginner learning, but I just say to her “trust me baby I can do this” and she does. Q: Does Erson give you any MMA advice while you are training? Miyuu: He notices a lot of things and does give me advice. Q: He didn’t tell you to not do MMA? Miyuu: No, because he knows that as soon as I say I am going to do something, there is no stopping me (laughs). I am sure he was really surprised that I decided to do MMA, but he didn’t try to stop me. Erson really helps me a lot with my training and sometimes we even train together. Especially in the mornings. I never would have imagined i’d be able to train with my son so it makes me really happy. I don’t expect this to happen until the day I die, but I have my younger brother here, my son, my dad, and my kids around me… I’d like to keep it going as long as possible. I also have my younger brother’s wife and their kids near me, so we all want to win together. That’s what makes us all so strong! (laughs). Q: I see! Although this is your debut match, I think it’s safe to say that like me, everyone else wants to see you have a long MMA career. Miyuu: Well… I always think to myself, “I don’t think I can get that far” but I always seem to be able to. I try not to think that way because I usually achieve the goals I set out to do. Athens, London, Rio, I worked so hard for those goals and have come this far. I just to try to live life one day at a time and give each day my very best. I don’t try to think about how much I should do, I just train hard everyday. Q: I heard that Kid is training you. Is he a very strict coach? Miyuu: He is strict, yes, but he makes it really enjoyable and is very very good at teaching. He knows my strong points, what I am good at, and brings out the best in me. I guess it’s because he is family, but I feel very safe around him. I am happy, but the training is very tough and grueling. Q: Your family all have the same goals, and are striving to reach them together. You son Erson is also fighting on the same card as you. Miyuu: I think it’s because Krazy Bee gym has a lot of our family members in it (laughs). Kid and my dad come down to watch, Erson is there, Kid’s wife Yui and my kids are there too, as well as Kid’s daughter. The gym is full of Yamamoto’s (laughs). Q: You have a strong heart. Miyuu: Yes and also, if it was wrestling, we wouldn’t have this opportunity (to train like this). I think it’s fate that I didn’t go to the olympics. God gave me time with my family. I have been alone for so long (because of what I do). A normal family reunion may be different, but when we are all training together, that is our family reunion. Q: Right now, women’s MMA is enjoying immense popularity. The women competing in RIZIN are also training and fighting at an amazing level. 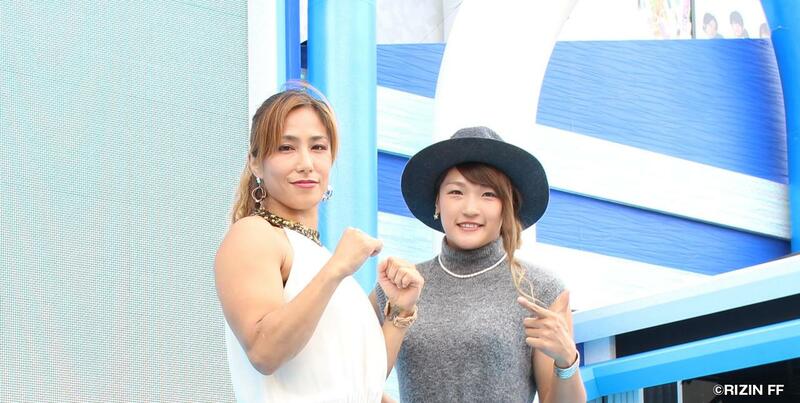 Girls like wrestler Kanako Murata and Gabi Garcia. Miyuu: Yes I think so too! I met Kanako once. She has amazing body strength, and great posture and balance. I think wrestlers are really strong. Even in UFC, I think wrestlers strengths are well known. That is another reason why I have the confidence to try this. Q: Have you had a chance to see Rena in action yet? Miyuu: Yes, I saw her fight on the NYE show last year. Q: What did you think? Miyuu: Her stand up game is very good. In saying that, she’s a professional kick-boxer so that’s a given. Miyuu: Yes, she is very cute! (laughs). When she made her ring entrance, I thought to myself “she’s cute!”, which is something I am not (laughs). Q: Do you think of certain things when it comes to your entrance? Miyuu: Yes, of course. If it was me, I would be thinking about my entrance music etc. I really enjoy the entrances of great fighters. My brother agrees with me when I say, but my favorite entrance of all time is (British boxer) Naseem Hamed. I love his ring entrances. Q: Both Hamed and Kid are really cool. Miyuu: I love their entrances. Also, when I saw Genki Sudo come to the ring, he just oozed “pro fighter” aura. Mayweather’s entrance is awesome too! He bring’s Justin Bieber to the ring, wow! (laughs). Q: We talked to Erson, who said you are next Midori Ito? Miyuu: What? Skating? (laughs). Ever since childhood, I’ve had strong legs and hips and I loved to jump, so maybe that’s why he said that, but that’s too much! (laughs). My family tends to over exaggerate a little at times. Q: They certainly do have a lot of funny and interesting things to say (laughs). Miyuu: I can only imagine that in a story (laughs). Q: Erson said you are the most normal in the family, and you have common sense (meaning others don’t). (laughs). Miyuu: Really!? I’m happy to hear that! In my 41 years on this earth, that is the first time I’ve heard that. No one has ever said that to me before! But the fact that my son said that, means I’m not strange (laughs). I must be doing something right (laughs).